Maeer's Maharashtra Institute of Technolgoy, Pune (MIT) established in 1983, is today among the top engineering colleges in India. MIT Pune, believes in providing its students the right resources and environment so that they can successfully tackle and find solutions to the most challenging engineering problems faced by society today. Arnab Chattopadhyay, Vishal Bagthadia, Sanat Munot and Sumod Nandanwar are a group of undergraduate students from MIT working on their final-year project, ‘Topology Optimization of an Unmanned Aerial Vehicle (UAV)’ under the guidance of Mr. Girish S. Barpande, Associate Professor, MIT Pune. In addition to this, the group also worked closely with Mr. Chaitanya Kachare, Associate Professor, Transportation Design from MIT Institute of Design (a sister institute to MIT Pune) who guided them with the additive manufacturing and the aesthetics of the final design. When designing a UAV, many factors must be taken into account, however, the fact that the vehicle is unmanned, removes a lot of design constraints and provides designers with significant freedom. Using topology optimization on such systems can help amplify this design freedom which often results in an exponential increase in the vehicle's performance. The objective of the team’s project was to design, fabricate and test a Quad-rotor UAV. Vishal had first learned about Inspire while implementing topology optimization on various car components at Accceleracers, the Formula SAE team at MIT. He was confident Inspire would provide a simple and fast solution to finding the structural improvements needed to enhance the quad-rotor UAV. Sanat had always been fascinated by the synergy between topology optimization and additive manufacturing because topology optimization generates the most optimized designs, however, when no manufacturing constraints are added, can quickly become very complex. Using subtractive manufacturing would make manufacturing of such designs extremely difficult, as well as costly. Additive manufacturing helps to remove these manufacturing constraints and enable the fabrication of the most optimized design irrespective of its complexity. To achieve the best performance possible, the group started off with a simple Unibody (Monocoque) air frame structure based on the design calculations and packaging space of electronics, components and payload. In the first design methodology, the design started by providing Inspire with the maximum design space. After running an initial optimization, the results were used to create the design space of the next iteration. This iterative process is referred as a multi-phased optimization process. The second design approach was to come up with a minimalistic design based on fundamental mechanics of the UAV. The minimalistic design space obtained was then directly optimized in Inspire. The accuracy of the load cases were essential to the team in this design workflow. These were verified by carrying out and recording real-time tests on an off-the-shelf airframe with similar configurations as that of the prototype. Using the gathered data, both the systems were modeled accurately in Inspire and the topology optimization was then carried out. Inspire’s easy to use interface and workflow helped the team to achieve better results by enabling them to focus more on the iterations rather than setting up the model. The shape control tools in Inspire also helped the team maintain symmetry about its principle axes which is very crucial while designing multi-rotor UAVs. The team even used Inspire to analyze the post-optimized model very easily and accurately. After the optimized designs from both the methodologies were finalized, the model was refined and prepared for manufacturing by removing the sharp contours and stress concentration points using the PolyNURBS tool. The PolyNURBS tool enabled the team to get a solid model closest to the topology optimized results with precision and efficiency. Once the part was redesigned based on the Inspire optimization results, the next step was to manufacture the part. 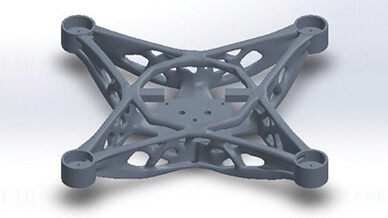 Design, fabricate and test a Quad-rotor UAV that uses topology optimization to decrease weight, and increase strength. 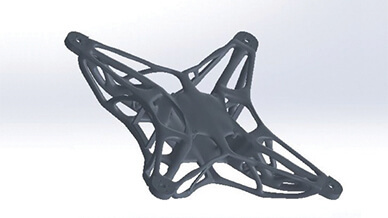 Optimization of UAV design space in Inspire to create two new lightweight designs that were 3D printed for the UAV. Once the drone was redesigned based on the Inspire optimization results, the next step was to manufacture the monocoque design. The team received support from DesignTech Systems Ltd, Pune, a leading CAD/CAM/CAE/PLM, additive manufacturing technologies and solutions provider and value added reseller for Altair solutions, as well as Stratasys 3D printers. DesignTech Systems supported the team in making the test samples & final designs in ABS M30 from Stratasys. Stratasys extended the team support by 3D printing the parts on their Fortus 450 MC machine at their Experience center in Bangalore. After 3D printing of the airframes the team carried out multiple fight tests to test the strength and flight characteristics of the airframes, the flights were very stable and the drone went through multiple crash tests unharmed. Maharashtra Institute of Technology (MIT), Pune, is an engineering college affiliated to the University of Pune, India. Established in 1983 by Vishwanath D. Karad, it is among the first engineering colleges in the private sector in Maharashtra.